There is nothing more Australian than the traditional timber verandah. This timeless icon with bullnose finish has developed beyond its humble beginnings to become a primary feature of modern homes. Not only its functionality and practical application but also to add a distinctive look and feel. 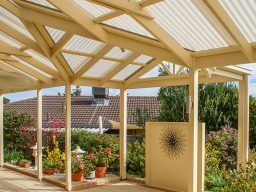 Timber verandahs are very popular in Adelaide homes and they are a very versatile structure which protects the exterior of the house regardless of the weather. It provides a covered outdoor space to use for the whole family. Timber verandahs at the front of your home can lift street appeal and enhance the look of a very simple façade. A new or replacement timber verandah will add style and functionality, giving you an outdoor space to be utilised and enjoyed to suit your lifestyle. Choosing environmentally friendly timber verandahs will bring a natural feel to your outdoor area. We can blend the look in with your home and garden. Timber is especially effective if you wish to add a more rustic look as timber verandahs are perfect for adding this characteristic. Use timber verandahs for the front of the house; side or rear, or as a wrap-around to provide maximum protection.